"A family favorite, this recipe is handed down to each generation. This rich, airy treat is best when served hot with jam or jelly." 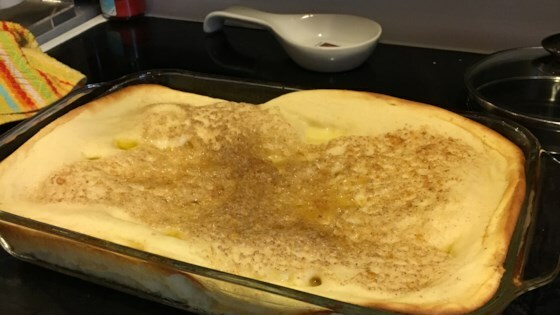 people always call this a finnish pancake, it's closer to french toast. a family fav. just heat the pan first. it's fantastic with syrup.from: a finnish girl. SISU!!! I grew up with this recipe and am so glad to have found it. It tastes great with syrup too. I lost this recipe years ago and now I can make it again. Never tried this before. It is delicious and was easy to make. Mine tastes and feels like bread pudding should, to me. I will definitely make this again and again! Scrumdiddly. I used raw sugar and added vanilla sugar. I also served this with maple syrup. The girlfriend likes it with nutella though.